We’re officially at the end of the 1980s! The Little Mermaid ushered in a string of hits, both commercially and critically, that would spark off the Disney Renaissance. From here on in, the studio was taken seriously, eventually working their way into the Academy Awards. The Little Mermaid is probably my favorite Disney movie. It’s the first one I saw, and the one I’m still able to quote incessantly, which is not to say that’s the story is perfect. The original story is downright depressing, and I won’t be inventing the wheel with my opinions against it, but seriously…the story is misogynist and a taste creepy. Regardless of all that, though, I adore this film. The perfect vocal cast, the introduction of catchy, Broadway-esque songs, and a love story supplemented by beautiful Disney animation. The Little Mermaid is a classic in my house, and always will be. Ariel (voiced by Jodie Benson) is a teenage mermaid who dreams of going to the surface to become “part of that world.” When she gives up her voice to the sea-witch Ursula (voiced by Pat Carroll) in exchange for legs, the little mermaid has a short amount of time to make a human fall in love with her. The Little Mermaid was a huge blockbuster for Disney, grossing over $200 million dollars at the time. It also ushered in a new model of home entertainment, getting released on video eight months after its release in theaters. It also introduced the composing team of Alan Menken and Howard Ashman, who would create some of the most enduring songs between this and Beauty and the Beast. Based on the premise alone, my main issue against The Little Mermaid is apparent. 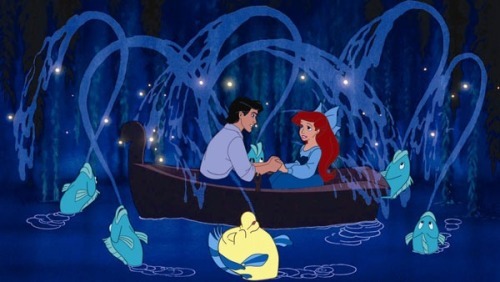 The theme involves a young girl (remember, Ariel is only 16, so not an adult) giving up her voice for a man she just met. Furthermore, the movie shows that you don’t have to be an eloquent speaker so long as you have a good body and pretty face. Ursula’s song, “Poor Unfortunate Souls” does detail all this, and the fact that the villain is stating it should imply that it’s wrong, but the movie never contradicts that. Even at story’s end when the couple are reunited, there’s no discussions between them or anything else to make Prince Eric love Ariel on a more than superficial level. With that out-of-the-way, allow me to gush sycophantically about this movie! I remember seeing this at the age of five, and after that I became a Little Mermaid addict – complete with bed sheets and wallpaper. The underwater world of the movie is filled with a monarchy free-floating (pun intended) world of beauty. The animation here has never looked lovelier, and while I know people say the ballroom scene is the best example of Disney animation, I’d argue that the underwater sequences are just as spectacular. The trickiest thing was getting Ariel’s hair to flow, and it’s entirely natural; a testament to the fantastic usage for the CAPS system that Disney was employing. The songs, voice cast, and pacing all work to the story’s advantage. There’s never a moment that feels like filler, and all the songs are fantastic and catchy. Composers Menken and Ashman were geniuses at creating big, show-stopping numbers, and it all started here. “Poor Unfortunate Souls,” “Part of Your World,” and “Kiss the Girl” are inventive compositions with distinct shifts in tone and direction. The first, sung by the gravelly voice Pat Carroll, is a strong burlesque number that isn’t sung but growled. The character of Ursula was modeled on drag-queen Divine, and Pat Carroll imbues the character with a flamboyant, boozy demeanor that makes you fear her as you laugh at her. Jodie Benson has such a sweet voice and makes “Part of Your World” not a teen’s angsty lament, but a soulful yearning for freedom. Benson is one of my heroes and she even when she’s petulant (as all 16-year-olds are), she’s fierce. Samuel E. Wright also have a great calypso-tinged voice that he lends to “Kiss the Girl” and “Under the Sea.” The sheer amount of songs that people are aware of, I think, makes this a more popular movie (musically) than Beauty and the Beast or Lion King. I love this movie, unconditionally and despite its flawed story. I grew up with Jodie Benson, Pat Carroll, and others telling me of a magical world under the sea, and I’m not ashamed to admit it; I still want to be part of that world! NEXT WEEK: With the close of another decade I’ll be taking a week off. I’ll return May 18th, kicking off the 1990s with the first Disney sequel: The Rescuers Down Under! I haven’t got the same nostalgia towards this film. I saw this as an adult for the first time many years after its home video release. While I agree with you that the performances and songs elevate this, I could not get past the story flaws that you mentioned. When it came time to watch it with my young daughters, around ages 5 and 6. I was sure to talk about the story strengths and flaws with them. I’m glad that you engaged with your kids and taught them the pros and cons of the movie. I’d like to think more parents do that, although I know a few who believe it’s a “kids movie” and therefore their child won’t absorb anything. While I wouldn’t necessarily consider Brave, Enchanted, Tangled, etc a big leap forward I do think they are moving more toward an empowered female and are nowhere near as bad as the early princesses. You know what Ashman and Menken worked on together before this? Yeah, that’s right. Little Shop of Horrors. Haha, I know….oh I hope that one’s good. Yes You can hear their same style in that one too. OOOOHH I can’t wait to hear That Episode. How sweet. What a wonderful story. It must have been fun to be 5 when this came out. (My 5ish movie was The Jungle Book.) I went to opening night with my wife. No kids at the time. There was a young woman in the lobby dressed in a mermaid costume. (OK, a bit creepy. And I acknowledge the story flaws.) There was a lot of excitement and it was quite entertaining. It started a wonderful ride with the coming Disney films. I became a bit disenchanted by the time of Hercules, the marketing machine was running full throttle and the scene was becoming quite formulaic. But that is a story for another time. I love The Little Mermaid, keeping in mind its flaws. Even for the big kids, it brings back pleasant memories. Haha, I always hate to show my age but glad to know my rambling stories are appreciated. You can easily feel a shift around the late-90s with Disney, especially once they realize that children are a “brand” that can be exploited. It’ll be interesting for me to revisit a lot of these movies post-Hercules because many of them I didn’t see; be interesting to figure out why I’ve avoided them. I think we are forgetting that the movie clearly states that Ariels choice to give up her voice was a BAD decision as it almost cost her her life and her fathers kingdom. Not forgetting lol. Where exactly does she learn that the problems that came from giving up her voice specifically caused those events. The sea witch would have found a way to take over eventually, and used Ariel’s lack of voice to her advantage. The problem is that Ariel still wins Eric, voice be damned. The sea witch’s adage that “body language” will win him over does! The plot rewards Ariel with her voice back, after it proves that she never needed it to win a man. I prefer the way Disney is entering this century by moving away from love at first site senarios as in Little Mermaid, Snow White, and Cinderella. I think the organic depiction of the evolution of a relationship, as in Tangled, Enchanted, and Princess and the Frog makes for a much more interesting story for young girls and not so young ones:). Persuing a man or woman you hardly even know is a tiresome Hollywood trope. I liked Brave especially because it had a heroine that scoffed at the notion that she must marry. Well said. While Disney’s females still have problems (the marketing of Merida being the most recent), you can tell they’re trying to move into a more female friendly direction. I haven’t seen Princess and the Frog since its release in theaters, so I’m excited to revisit it.